Sandwiched between Dallas and Fort Worth, visitors to Texas could be forgiven for missing Irving; the truth is that the borders between the cities are vague and hence Irving is effectively an extension of its neighbors. As a result of this, Irving's districts are quite vague and not easily definable, as is the case with many of America's big cities. Visitors looking to get the true flavor of Irving should visit Las Colinas, which is one of the city's most influential and characteristic parts of the city. 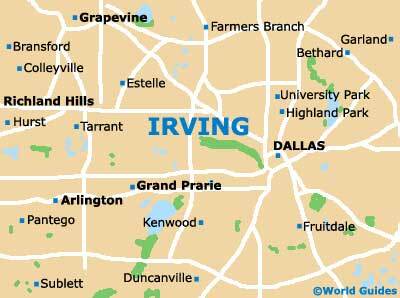 Here are Irving's main neighborhoods and districts. The airport freeway region of Irving is home to a number of large shopping outlets and is only a short drive from Dallas Fort Worth International Airport. The Las Colinas region is the city's urban epicenter and consists of a real estate development covering some 12,000 acres / 4850 hectares. 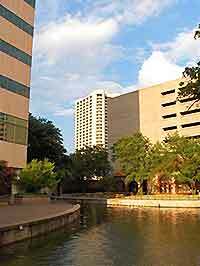 Las Colinas is a sub-region of the downtown district and is where much of Irving's activity is focused. Irving's downtown district is the focus of its business activity and also houses a significant portion of its residential population. Here you will find many of the city's attractions, such as the Las Colinas Movie Studios and the Mustangs of Las Colinas Museum. The Heritage District of Irving is the focus of the city's historic influences. Here visitors can see traditional architecture and remnants of the town's railroad past. Heritage Park is the focal point of the district.